Every purchase of jewellery has its own story, its own meaning and unique reason for purchase, whether it’s an engagement ring, a birthday present or an anniversary gift, every piece has always been meticulously selected for its recipient. So, for us it’s fantastic to be able to offer a service in which we can tailor make items of jewellery to our client’s exact specifications, enabling them to give precisely what they have in mind for their loved ones. We pride ourselves on being the home of fine diamonds. When you are investing into some of the world’s finest diamonds available, it makes sense to have a handmade setting, ensuring complete excellence at every stage. 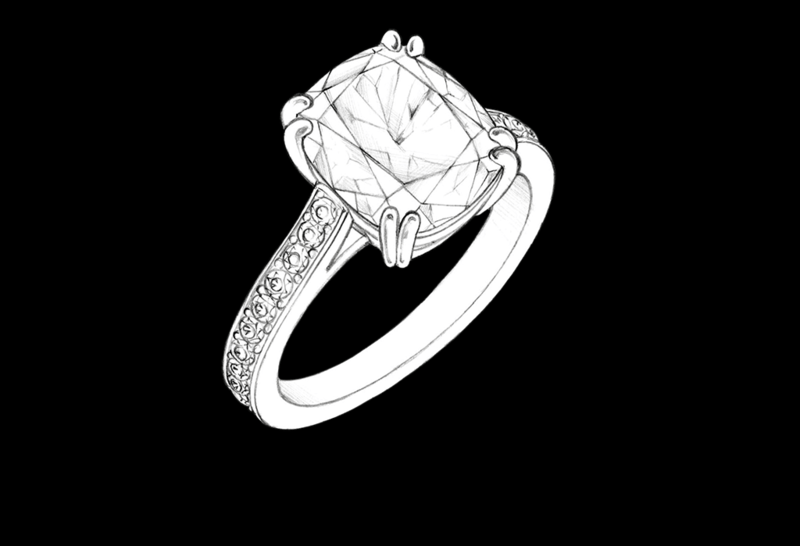 Whether a client sees a design they fall in love with but they want a particular size of Diamond, whether they love a style but would like a pink Sapphire rather than a blue Sapphire or yellow gold rather than platinum, we can make a ring to their needs in our workshop, we want all of our clients to leave with exactly what they would like, we want absolute perfection. If needed our workshop can sketch you a design to help you envisage exactly what your piece will look like, and once you are happy with the design we can proceed with the creation of your tailor-made design, it’s a very exciting time and well worth the wait. We are extremely proud of our onsite workshop and the skill and dedication of our expert craftsmen and women who handcraft our pieces, it’s a pleasure to be able to hand these expertise onto our clients. It is truly amazing to see a design come to life, particularly when you have been involved with the design process, its such a wonderful journey and a story you will never forget and as a small family business we are proud to offer such a personal service to the highest standard possible.